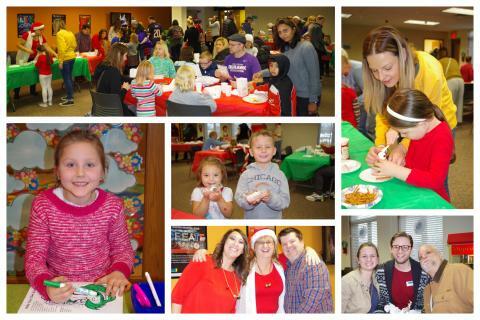 Bartlett Library kicks off the holidays with food and fun! On Sunday, Dec. 2, 300 youth and adult patrons met at the Bartlett Public Library District for a fun-filled day of holiday activities at their "Red, White & Green, and Everything in Between" event. As patrons walked into the front lobby of the Library, they were welcomed by a display of dazzling lights, ornaments and presents. The holiday cheer continued as they made their way into the meeting room where there were stations of various activities for them to enjoy. A station was set up for patrons to make holiday cards to be sent to the organization called "Cards for Hospitalized Kids." From there, the cards will be sent out to children in hospitals all over the country. Over one hundred cards were made at the event, and patrons were very grateful to be able to participate in such a cause. There were also three rounds of BINGO throughout the event where patrons could win winter-themed prizes. Director Nance was a caller in addition to Library Trustees Dave Barry and Peggy Bucaro. A snowman craft was available as well. The craft consisted of three marshmallows glued together with frosting, pretzel sticks for arms, red hots for buttons and chocolate chips for eyes. Let's not forget the Rolo chocolates used for hats to finish off the look! As for some yummy treats, there were cookies and hot chocolate provided by the Bartlett Public Library District Foundation, popcorn and punch provided by the Friends of the Bartlett Library, and then there were hot dogs from Dogfather Hot Dogs. When they were finished in the meeting room, patrons made their way upstairs where the Youth & Teen Services Department became 'Whoville' for the day. Children colored in a Grinch mask that they could wear, took their pictures next to a life-size Grinch and Max wooden photo prop and they could watch "How the Grinch Stole Christmas" in the storytime room if they wished. Also upstairs, Youth & Teen Services Librarians Mary Beth Fuller and Phyllis Sadowski lead three sessions of a "Family Winter Sing Along" during the event. They lead patrons in singing holiday favorites such as "Jingle Bells," "Up on the House-Top," "Frosty the Snowman," "You're a Mean One, Mr. Grinch" and many more. Children really got into the spirit as they sang and danced along to each song. Patrons were also able to enjoy a few activities that the Library will continue to have up all month long. There is a jar filled with peppermints, which they have to guess how many are inside to win the lot of them. Presents are spread all throughout the building, which patrons must count to see how many there are in total in order to win movie passes to Classic Cinemas. Patrons may also bring toys to donate from now until Dec. 16, as the Library is a donation spot for the Hanover Township Annual Toy Drive. Then, to wrap it all up, there is a "25 Days of Goodness" calendar in which each day a new good deed is revealed for patrons to accomplish. Examples of this are "Help decorate for the holidays," "Donate clothes you no longer wear to charity," and more. If you missed this event, an upcoming program at the Bartlett Library is the "Behind the Curtain: An Insider's Look at the Financial Aid Process" on Wednesday, Dec. 5 at 6:30 p.m. This free seminar begins with a review of the action steps you can take to reduce college expenses. It then reveals what really goes on behind the scenes to determine what you will pay for college. Find out how financial aid officers really make their decisions on the size of your financial award. You will also discover creative, little-known ways to pay for college as you learn to navigate the maze of formulas, policies and rules that determine college costs. Parents and caregivers with teens are encouraged to attend this free, 60-minute seminar presented by My College Planning Team. Registration required. For more information and a complete listing of scheduled programs, call 630.837.2855 or visit www.bartlettlibrary.org. Founded in 2000, the Bartlett Public Library District Foundation was established to provide additional sources of revenue to enhance services that are not paid through property taxes. The fund is divided into two parts: The Main Fund, which supports general projects for the Library, and the Patti Perkins Fund, which was established in memory of the Library's former Circulation Department Manager. Donations to the Patti Perkins Fund add to the collection of materials related to women's health and support programs on this subject. Since its inception, over $15,000 worth of books and audiovisual materials have been purchased for the Library from donations to the Patti Perkins Fund. The Friends support the Library in their mission to provide quality services and programs to the community. Since their inception in 1983, they have donated over $130,000 to the Library. In addition, every child that receives a new Library Card also receives a new book donated by the Friends. The Friends participate in many activities during the year, including a perpetual book sale (located in lobby), Fravinia outdoor concerts and their Library volunteer program. The dues, along with all the money raised throughout the year, go directly to benefit the Library. The Friends have contributed funds for programs, Hot Reads, computers, furniture & equipment, online homework help and much more.